I should label this: inexpensive Cape Town things that are good for your soul and wallet too. Those experiences are rare in a city where many of us are struggling with rising costs so I’m sharing my recent discovery. 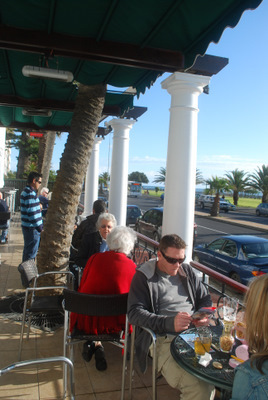 If you’re looking for a feel-good spot for afternoon tea with a sea-facing promenade views, the Harveys bar area at Winchester Mansions on Sea Point’s Beach Road is hard to beat. The plus points: sunny views of Sea Point promenade from outdoor terrace tables, or in chillier weather, through glass doors from barstools or lounge couches. 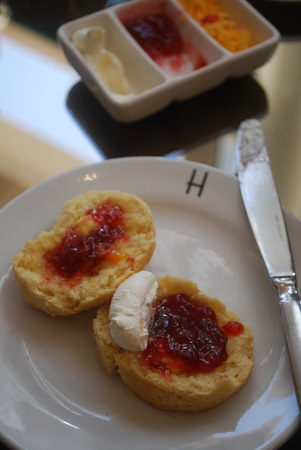 Freshly baked scones that you sniff before you see, served with butter, jam, cream and grated cheddar. It’s a steal at R24 for a two-scone portion. Lavazza coffee or teas are offered as hot beverages. The downside: this popular four-star hotel lounge doesn’t have a lot of seating and you can’t reserve a table. We’ve taken a toddler successfully, but this is where adults unwind so it’s not an ideal option if a noisy, energetic brood is in tow. SAVOURY TIP: If you stick around long enough, the Harvey’s white or red carafe tastes just fine for a late afternoon sundowner, priced at R28. Partner it with the pizza of Alsace, Flammkuchen, a topping of bacon, onion and seasoned sour cream on an ultra-thin rectangular base. Ideal for two to snack on if you don’t fancy the complimentary bar nuts. Sometimes it’s really good to be in Cape Town. WINCHESTER MANSIONS, 221 Beach Road, Sea Point. Tel 021 434 2351, Winchester. Scones served daily.